This training and consultancy activity helps member states of the European Union and the European Centre for Modern Languages (ECML) of the Council of Europe ensure access to quality education and helps bridge the attainment gap between these learners and non-migrant pupils. The initiative draws on a wide range of successful ECML projects and resources which focus on inclusive, plurilingual and intercultural approaches. The workshops offer tailored support to different educational stakeholders, including teachers, teacher educators, administrators and school leaders, on how best to develop learners’ competences in the language/s of schooling, whilst valuing all children’s home languages and drawing on these languages as a rich resource for learning. The workshops will offer support on how to value children’s home languages as well as on how to draw on these languages as a rich resource for learning. The long-term objective of the initiative is that learners with a migrant background are better integrated into national education systems, leading to better educational achievement, which in turn will contribute to improved self-esteem, better employment prospects and a more cohesive society. Support materials will be developed and adapted, by drawing on key ECML tools and resources, to meet the needs of specific contexts. 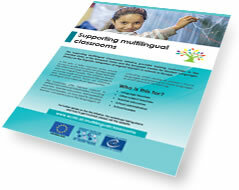 a dedicated section on the ECML website outlining key resources for multilingual classrooms. Training activites can be conducted in English, French or German. Online Seminar 2017: "Supporting multilingual classrooms"
“Teachers and school leaders from 12 different schools from all over Portugal attended the Council of Europe workshop Supporting Multilingual Classrooms (SMC) on 21 and 22 February 2019. The Lisbon workshop, part of a series being held in a number of member states, has been hosted by the Ministry of Education (DGAE). During the last years the number of multilingual classes in Portugal has increased continuously. Some of the teachers attending the workshop come from schools where up to 50% of the student population speak at least one language other than Portuguese at home. At the workshop, participants explored tools that support both second language development and the promotion of a better understanding of learners' specific needs. Creating an inclusive school environment in which all languages, including all home languages, are valued was an important theme. Participants discussed how multilingualism in their schools can become an asset, and how a whole school approach to supporting it can be developed. This intercultural approach examines how learners' home languages and cultures can be taken account of when planning classes, how links can be established between home languages and the language of schooling, and how the knowledge and experience that learners, parents and community groups bring to Portuguese education and society can be harnessed. At the end of the workshop the 12 participating schools decided, supported by the representatives of the Ministry of Education (DGAE), to build a network for mutual support. All tools and materials from the workshop will be used in the participating schools. In this way the workshop results can contribute to the teaching and learning of languages in Portuguese schools. ECML project website: Supporting multilingual classrooms – EU-ECML cooperation agreement 2018-2019 "Innovative methodologies and assessment in language learning"
That the ECML experts were willing and able to adapt the type of workshop and inputs they led at the events in Scotland made a huge difference in terms of encouraging teachers to attend, as we currently have a national shortage of teachers and difficulty in finding supply teachers. In order that as many teachers as possible could attend, the experts tailored their inputs into two x 1 day events, the second day a repeat of the first. Despite the challenge of truncating a two-day workshop, the team put together a highly effective, engaging and impressive event which received 100% positive feedback from the participants. As an observer of each day’s proceedings, I saw how engaged the teachers were throughout each day; they appreciated the opportunity to share practice , as well as learn about methodologies to enhance their own pedagogy. There is possibly a gap in provision in Scotland of relevant, up-to-date training for teachers who are tasked with integrating learners with limited or no English into their classrooms, as well as training which equips teachers with approaches on how to ensure that migrant children’s home language(s) are recognised and respected. This ECML workshop has helped to open up a debate on how we provide support for our school-age ‘New Scots’. The ECML experts were knowledgeable, approachable and highly professional - they thoroughly deserve the very positive feedback they have received from the Scottish participants! ECML project website: Supporting multilingual classrooms – EU-ECML cooperation agreement 2017-2018 "Innovative methodologies and assessment in language learning"
ECML colloquium "Teacher education for linguistic diversity: the contribution of the ECML" (Graz, Austria, 13-14 December 2017) – Register online now! With the increasingly diverse linguistic and cultural composition of classrooms around Europe, this topic has become a central issue in language education. This one and a half day event will bring together several renowned experts in the field of pluralistic and pluricultural approaches to discuss progress that has been made in this field in recent years, giving special emphasis to how projects initiated under the auspices of the ECML have supported the development and expansion of this important area. The event takes place in cooperation with the European Commission, within the framework of the EC-ECML "Innovative methodologies and assessment in language learning" joint action and in particular its "Supporting multilingual classrooms" initiative. Costs: no attendance fee; participants will be expected to cover their own travel and subsistence costs. Registration: 50 places in total will be available and these will be allotted strictly on a first-come, first-served basis. Linguistic and cultural diversity is now the norm in European classrooms. What does this mean for teachers, both language teachers and teachers of other subjects? How can teachers adapt their methodology to ensure that this linguistic and cultural capital becomes a rich resource for learning? This seminar aimed to encourage teachers to question their own beliefs as they discover for themselves the answers to these questions and the wide range of free resources developed by the European Centre for Modern Languages of the Council of Europe (ECML) in support of an inclusive, plurilingual and intercultural approach to teaching and learning. A recording of the seminar involving Sarah Breslin, Executive Director of the ECML, and Terry Lamb, Co-coordinator of the ECML-EC Training and consultancy activity “Supporting multilingual classrooms” is now available on YouTube.